Nissan is bolstering its small-SUV roster with a new subcompact crossover that was unveiled at the 2017 Los Angeles Auto Show. 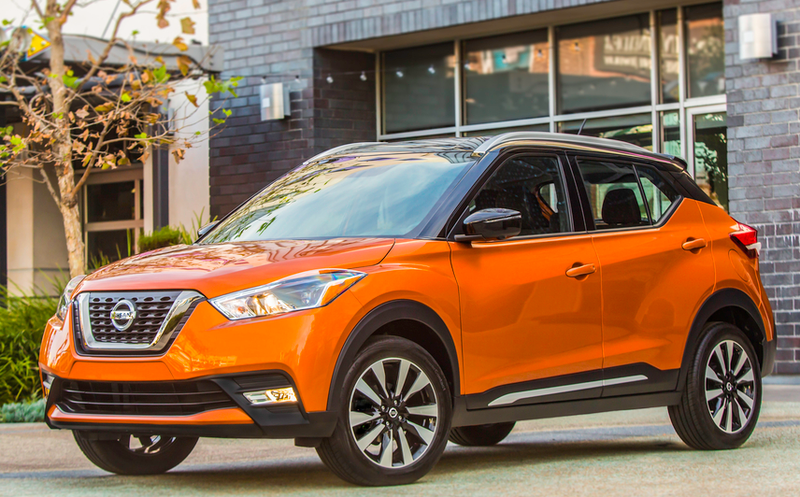 When it goes on sale in mid-2018, the 2018 Nissan Kicks will be the smallest SUV in Nissan’s lineup, slotting in below the Rogue Sport and replacing the outgoing Nissan Juke. The Kicks takes its styling cues from a concept vehicle of the same name that Nissan showed at the 2014 Sao Paulo International Motor Show in Brazil. The lone powertrain is a 125-horsepower 1.6-liter 4-cylinder paired with a continuously variable transmission (CVT). Unlike almost all other subcompact SUVs, the Kicks is front-wheel drive only; AWD is not available. Nissan is anticipating a fuel-economy rating of 33 mpg in combined city/highway driving. Nissan is positioning the Kicks as a vehicle for active urban singles and couples. The turning radius is a compact 34.1 feet and ground clearance is seven inches (“to tackle poorly maintained roads and speed bumps with ease”, says Nissan). Passenger versatility is also a focal point; Nissan says the Kicks’ rear-seat area has a flat floor, with headroom and legroom that are similar to larger crossovers. The rear seats fold in a 60/40 split, and Nissan says the rear liftgate opens tall enough for a six-footer to access the cargo area without ducking. The Kicks follows Nissan’s traditional trim-level structure; it’s offered in base S, mid-level SV, and top-line SR models. A forward collision warning system with automatic emergency braking is standard on all. Available safety features include a blind-spot monitor with rear cross-traffic alert, and Nissan’s 360-degree Intelligent Around-View Monitor with moving-object detection. Other available features include Apple CarPlay/Android Auto connectivity, LED headlights, heated mirrors, heated front seats, automatic climate control, 17-inch alloy wheels, and a Bose Personal Plus sound system. The Kicks is slated to arrive in dealerships in June 2018. Full pricing was not released, but Nissan says the entry-level Kicks S will start under $19,000. In some ways, the genre-bending Nissan Juke inaugurated the subcompact crossover-SUV segment when it debuted as a 2011 model, but its odd styling and cramped rear seat and cargo area kept it on the fringes of the marketplace. The new Kicks probably won’t be as spirited behind the wheel as the surprisingly sporty Juke, but it certainly promises to be much more popular with mainstream buyers. The fun styling and dynamic color options strike us as just zany enough—not weird for the sake of weird like the Juke or Toyota C-HR. Even though the Kick’s lack of all-wheel drive might put off some Snow Belt shoppers, it looks like Nissan has another hit on its hands here. Written by: Damon Bell on November 30, 2017.